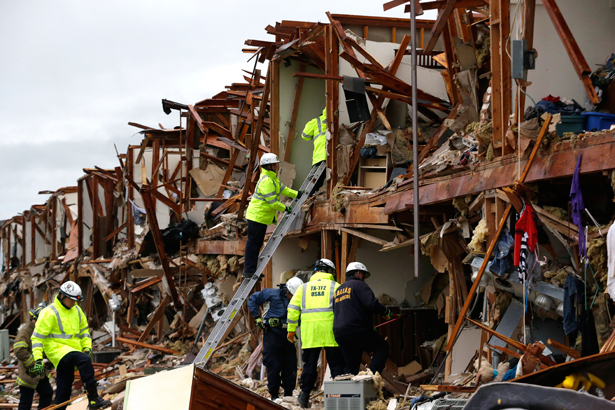 While questions linger about how a fertilizer plant in Texas blew up, documents suggest the facility faced little regulatory oversight. Last evening, a fertilizer plant owned by Adair Grain Inc. in West, Texas caught fire, then exploded, killing several people and wounding at least one hundred. The blast, caught on video from afar, destroyed nearby homes, businesses and a nursing home for seniors. There are still lingering questions about how this happened, but documents suggest the plant faced little regulatory scrutiny. The Dallas Morning News reported that the plant filed papers with state and federal environmental regulators in 2006 claiming that there were “no” fire or explosive risks at the plant. "The worst possible scenario, the report said, would be a ten-minute release of ammonia gas that would kill or injure no one," noted reporter Randy Lee Loftis. Residents complained about the smell of ammonia as they "went to bed" that year, according to a filing. 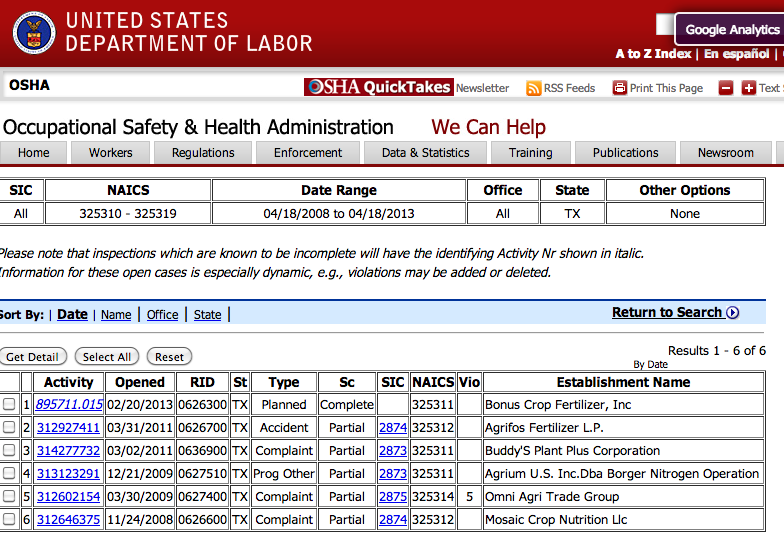 As I pointed out on Twitter last night, in the last five years, the Occupational Safety and Health Administration (OSHA) has only inspected five fertilizer plants in the entire state of Texas—and the plant in West, Texas was not one of them. OSHA is severely understaffed and operates with a tiny federal budget. With the agency's current resources, that means "OSHA can inspect a workplace on average once every 129 years and state OSHA inspectors could inspect one every 67 years." There are specialized inspectors for chemical plants that, in theory, should have covered where OSHA or environmental regulators left off. The US Chemical Safety Board, which came into operation in 1998, is the commission tasked with investigating safety violations. Like similar boards, the Chemical Safety Board has virtually no resources: only a $10 million budget to cover every violation in the country. The Center for Public Integrity has a new, incredibly damning report, showing that the agency has failed to investigate several recent disasters, including the death of a worker at refinery in Memphis last December. Budget cuts, and the sequestration, loom large as every federal workforce is scaled back. Rather than provoking reform, at least in the short term, tragedies like this may get worse as there are fewer and fewer regulators to ensure safety at these types of facilities. The Republicans enjoy a comfortable majority in the house even though Democrats won at least 1.1 million more votes. Lee Fang explains why—and why it's likely to continue.